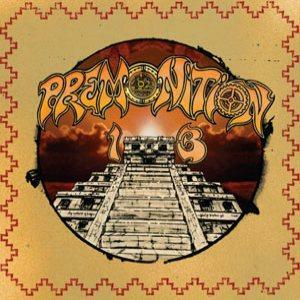 Wino has yet another new band called Premonition 13. This is the bands first full length record after the debut 7" that came out earlier this year. Wino plays all the guitars and sings on the records, while live the band has two guitar players in order to play these songs. Beauty starts side A with some really nice spacey, and even backwards guitar layers before the vocals kick in. This is a very cool spacey song. Hard to Say is a hard rocking song that sounds more like some of his other bands but I like the dual layers of psychedelic guitars on this one. Great track but short. Clay Pigeons has a riff like Spirit Caravan era material and features a ripping wah solo. Senses is a slower short track. Side B starts off with the La Hechicera de al Jeringa prelude, which is quite spacey and then the real song of the same title kicks in and starts with a nice guitar solo with a bit of delay on it. This is a long, slow, emotional and heavy track. The end section has some spaced out guitar buried underneath the slow doomy riif. Deranged Rock n' Roller is a mid paced rocker with some dirty, gritty guitar and occasional slide guitar. Great guitar on this track. Modern Man starts with a pretty guitar and then the monster guitar riff kicks in. This is one of those catchy tracks with a sung chorus. Sounds like it was written about the time he did his Adrift record. Peyote Road ends this damn cool record and has a lot of nice melodic guitars and I like the double tracking section. Cool and different song. All those people who were describing this record as influenced by King Crimson and progressive rock are way off the mark. This is solid WINO, just a bit more spacey, melodic, more time changes and not so angry but pure WINO.